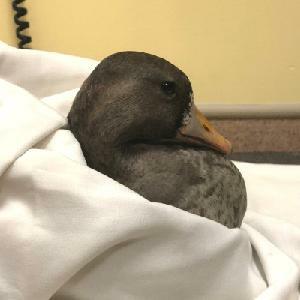 This poor young goose found herself all alone after a fractured scapula (shoulder) prevented her from flying away with the rest of her flock. She was in rough shape when she arrived at Wild ARC. On top of her scapula fracture, she also had parasites, multiple fractures in her feet, bruising on her legs, feet and bill and was very thin and weak. She will need to be treated for the parasites and requires medication to manage the pain from the fractures and bruising. To ensure she returns to a healthy body condition, she will need to be monitored closely and provided with a specialized diet. Greater white-fronted geese are very social creatures and form very strong bonds with their families and mates.They reach sexual maturity after two years of age so this goose is too young to have found a partner yet, however being away from her family adds to the stress of being in care. Staff at Wild ARC have provided this young goose with a mirror for company where she spends much of her time. Southern Vancouver Island is at the northern point of the non-breeding range so when the time comes for release, every effort will be made to find a flock of her kind where, hopefully, she will be able to reunite with her family. However, she has a long road to recovery before she can be returned to the wild. You can help this beautiful goose go home – please consider a donation towards her care today.